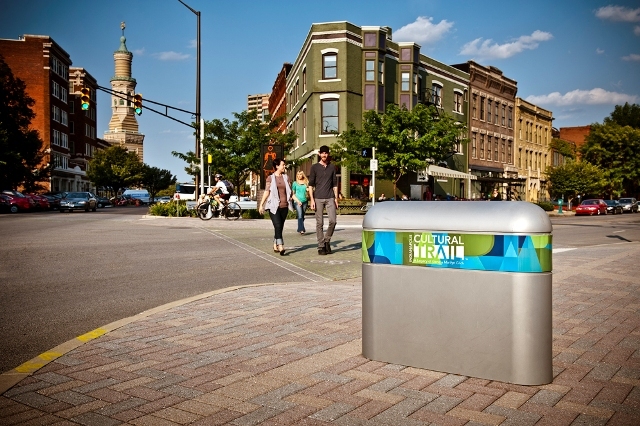 Back in 2007, we highlighted the Indianapolis Cultural Trail project in Bold Moves, Brave Actions, a feature that looked at five cities on five continents making exceptional strides toward becoming more people-friendly places. Indy, we wrote, was “taking what may be the boldest step of any American city towards supporting bicyclists and pedestrians” – an especially exciting thing to see happening in a city that may be most famous for speeding cars. Now, five years later, the project’s big debut is upon us! Today marks the official grand opening of the Indianapolis Cultural Trail. Tomorrow, May 11th, 2013, the city will host Get Down On It, a massive, downtown-wide effort to stage 75 cultural and entertainment events all along the eight-mile trail route. We are particularly thrilled to see this project come to fruition, and not just because we had the opportunity to serve as part of the design team. 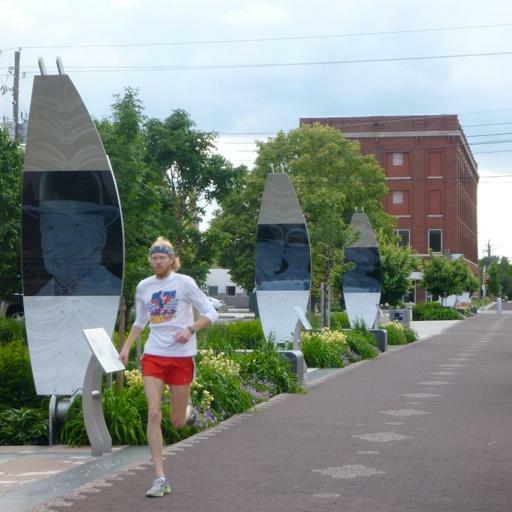 The Indianapolis Cultural Trail is a significant project in and of itself, but it gains even more significance when considered in the larger scope of the transformation taking place in this Midwestern state capital. Driven largely by the efforts of the Central Indiana Community Foundation (CICF) over the past decade, Indy is fast becoming a city where Placemaking is a way of life for all citizens. The focus on place, from the top down and the bottom up, is creating a stronger, more vibrant city that doubles down on the local people and places that make it most unique. To mark the opening of the Cultural Trail, we spoke with Brian Payne, the president and CEO of the CICF and the “zealous nut” who took this amazing project from inspiration to implementation. Congratulations to Brian and everyone at the foundation for this remarkable accomplishment! We're lucky to have had the pleasure of working with him, and to have seen the potential that a community foundation can have in leading a Placemaking agenda for a city. We've gotten to know many of the projects of his Inspiring Places Initiative through having PPS lead trainings and technical assistance, and are looking forward to starting work shortly on major transformation of Monument Circle (a project that Brian had us help kickstart back in 2008 with a concept paper), the heart of the city and the Cultural Trail. Why don’t we start this off by having you tell us a bit about what the Indianapolis Cultural Trail is, and how the project came about? The trail is, from an experiential perspective, a great way to experience all of the great stuff in downtown Indianapolis; it’s also meant to serve as a catalyst for areas that need a catalyst. It is a curbed, buffered, beautifully paved, richly landscaped, and artfully lighted bike and pedestrian pathway that connects to every arts, cultural heritage, sports, and entertainment venue in the urban core. The inspiration for the idea was that it was going to connect to five designated cultural districts downtown in order to make those districts more vibrant and viable by connecting them and giving people a way to get to them that was walkable and bikeable. Most bike trails are greenways; they’re a way to escape the urban environment and experience nature. The Cultural Trail is actually an urban trail that connects you to everything that’s good in the city center. What makes it unique is that it’s an urban exploration trail, as opposed to an urban escape trail. One of the big benefits of this project is that it’s changing what we value in Indianapolis. We value beautiful design more since the trail came up; we value bicycle culture; we value sustainability. It’s also a major amenity that the tourism and convention industry is selling and appreciating. It’s a unique experience that makes Indianapolis different or better than it was as a destination. Even in these tough economic times, it’s actually been a catalyst for over a hundred million dollars of new real estate development. People are even moving their offices in order to be on the trail. We’ve had three major nonprofits relocate so that they can connect to the vibrancy this project is generating. How did you first come to realize the importance of focusing on place? Did you come to Placemaking while you were working on the trail, or was it something you were aware of before? It’s funny…today, I’m considered a local expert on Placemaking, but it was actually the trail project that taught me what I know. It wasn’t like I was an expert going in. Before I joined CICF as the president and CEO, my career was in managing professional theater companies. A few months after getting hired at the foundation, I was appointed by the mayor at the time, Bart Peterson, to be a commissioner of a new initiative that was originally scheduled to be a five-year, $10 million effort called the Cultural Development Commission. The goal was to establish Indianapolis more as a regional or even national cultural destination city. We wanted to make our own citizenry connect to our local cultural offerings at a higher deeper level, but also to establish ourselves as a cultural city. My perspective was always: what are we going to offer that’s different, authentic, or unique compared to the cities around us? Why would someone from Chicago, Cincinnati, St. Louis—or, thinking nationally, Denver, Austin, etc—why would they come to Indianapolis for a cultural experience if we just offer what every city offers: regional theater, symphony, dance company, etc? What was going to make us a destination? There was this idea presented to us, as new commissioners, that there was a significant opportunity in the historic retail villages that were either part of downtown or just outside of it. It struck me that, inherently, cultural neighborhoods are unique from other cultural neighborhoods. Focusing on drawing out those neighborhoods’ distinctive qualities seemed like a great way to make the city a unique destination that people would travel to. I tried to raise money for that and got nowhere, because everyone said it wasn’t going to work because these districts were too disconnected: from downtown, and from each other. So, I thought, let’s connect them! I was a new bicyclist at the time, and was enjoying this rail trail that we had called the Monon Trail. And I thought well we can just connect these downtown districts by creating an urban version of the Monon Trail. Over the years, the idea got more and more ambitious. We could have connected the districts with a five mile trail, but the trail wound up being eight miles. It also became a bigger idea, to connect every significant venue downtown. It’s also now the hub for an entire countywide system of trails. It connects the three other major trails in our multi-county area. There are a lot of other exciting new public space projects happening in the center of Indianapolis. Can you talk about the role that the trail has played in driving that shift toward the Placemaking idea? PPS was certainly a big influence, but what’s happened is that, at CICF, the trail became the first of what we now call community leadership initiatives. The foundation used to be a straightforward, donor-advised grant-making organization. But we saw the trail project as a community leadership opportunity, and we started tying other community leadership efforts to what we were learning while working on the trail. In 2005 (the trail idea started in 2001) we created two community leadership initiatives, one of which was called Inspiring Places, which has played a major role in encouraging people in Indianapolis to care more about Placemaking. We now have this idea that we should be a leading city in America for creating access to art, nature, and beauty every day, for everybody. Today, many of the people who cared about this trail project have been emboldened by the success of the Cultural Trail and Inspiring Places; they feel like they can get their ideas done, too. They feel like it’s worth being an advocate and having big ideas because they know there’s momentum around that now. There is now a huge, huge focus, and a lot of energy and people who are spending their creative time and resources making Indianapolis this great place. You said something interesting earlier about cultural neighborhoods, and how each one is inherently different from other neighborhoods. How has the trail’s development affected the city’s neighborhoods? Is this energy spreading out from downtown? It really is. Since we took on the Cultural Trail project we’ve been making sure that we balance that with our neighborhood efforts. We’ve had opportunities through that to work with some great partners. We have a very dynamic LISC in Indianapolis, and they had this idea of doing neighborhood quality of life plans. They’ve gone in and worked from the grassroots, doing neighborhood organizing around this idea of what the neighbors want to do to improve their local quality of life. The trail created major awareness, so among other things these neighborhoods want walkable and bikeable neighborhoods, they want cultural assets, and beautiful green spaces. All of these things reinforce each other. Another great partner has been Keep Indianapolis Beautiful. They used to just be a neighborhood beautification initiative, but over the past ten years KIB has become a major community development organization. They use their principles of enhancing nature, expanding the tree canopy—the tools that they’ve always used—but they frame it with a much bigger ambition. Now, their work is about transforming neighborhoods and quality of life. They think much more comprehensively about what they do. All of these great organizations, we’re working together from different angles, but we all reinforce each others’ work. 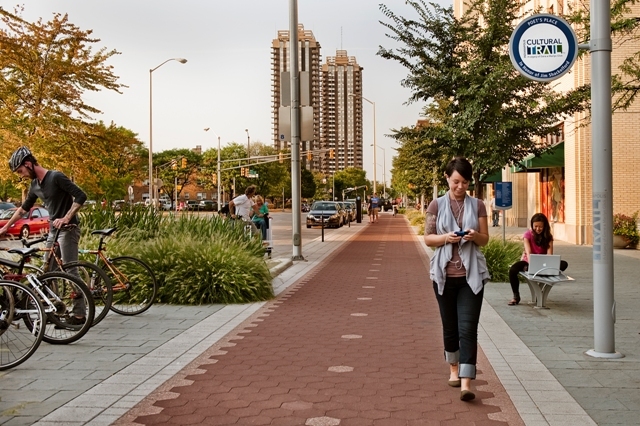 You’ve been talking about connectivity; how do the Cultural Trail and the Inspiring Places initiative improve connectivity in Indianapolis? At our foundation, we think that connectivity is the theme of the 21st century. Whether it’s physical connectivity, digital, social, community—we think that a city that creates connectivity at all different levels is going to be a successful city. We’re big believers that innovation and creativity come from the collision and connection between different sectors and different kinds of people. We organize all of our work around connectivity. The trail project is all about the journey, and the idea that the journey should be as exciting and inspiring as any of the destinations in our city. In fact, the journey itself should be a destination. The journey needs to be a great inspiring thing to do.